The race starts from the bottom of the field just beyond the last farm building (now a school bunkhouse). Please note this is about 10 minutes walk from registration, so give yourself plenty of time. The first quarter of a mile or so is on an old cart track, or to the left of the trees through the field, then out onto a grassy slope getting steeper up to a fence and stile. After the stile, a walkers’ path keeps to the right-hand side of the valley, climbing steadily and narrowing towards the skyline. The path levels out as you reach the main scarp, passing the obelisk in memory of Tommy Jones, a small boy who got lost and met his end here. You will probably be feeling like joining him by now. NB do not take a sudden left at any point from now until after the summit of Pen y Fan – there is a precipitous drop. Now the steepest part of the climb begins, about half a mile up the man-made path up to the summit of Corn Du. A marshal will be at the summit cairn (cheery wave please) – you should keep going straight on across the summit plateau (remember… no left turns, but don’t turn right either unless you want to go to Merthyr). Then a loose scrabbly descent takes you to a large path across to Pen y Fan, climbing on a man-made path onto the large summit area. 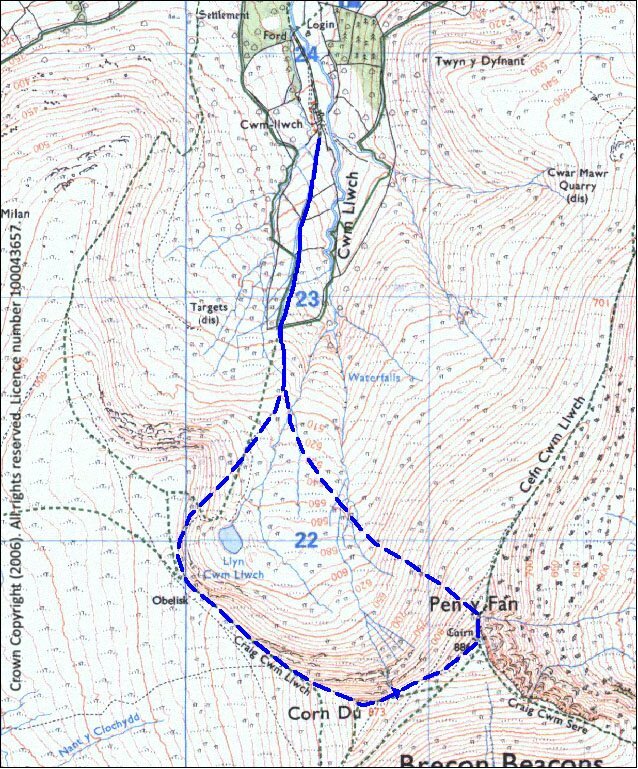 If you keep near the left edge from Corn Du and onto Pen y Fan, we can see your progress from the start/finish field. Keep eyes peeled for the rather nice sandstone ripple-bedding, and then give a lovely smile for the marshal at the summit cairn. Note in passing that the cairns on Corn Du and Pen y Fan are Bronze Age burial mounds, each having several stiffs within (possibly eminent fell runners of the day). At the Pen y Fan summit cairn, you may now turn left, in fact you must, while making a mental note that Keith Anderson descended from here to the finish in 7 minutes. Try to leave the loose eroded path as soon as you can, in order to take a straight-line grassy descent. If you get off the path within 10m of the top that’s fine, though it is quite steep - we've had a few refusals here. You can go further on down the path and ridge if you want, but if you go too far before turning left you run the risk of having to cross the valley where the stream turns into a ravine. The descent is steep and a bit tussocky, with enough sharp stones to make you think twice about rolling down. Head straight down the slope, until it levels out, when you should bear a bit right across the rougher ground. If you head for the right-hand shoulder of the hills on the opposite side of the valley (NW), you won’t go too far wrong. This bit can be marshy, with a couple of small streams to cross, but you should find yourself re-joining the outward route not far above the fence and stile. From there it’s about another half mile to the finish – many runners stay in the field to the right of the line of trees, instead of following the track. NOTE – please take extreme care on the summits of Corn Du and Pen y Fan, especially in poor visibility, as there are dangerous drops on the northern side of Corn Du and on the eastern side of Pen y Fan - these are on your left during the race. Take care when descending off the summit plateaus.